Mumps is not something children born today need to worry about due to available vaccines. Mumps in adults, however, is still a pertinent concern since older individuals are less likely to have been vaccinated and can still to contract the illness. Additionally, the mumps vaccine that was in use from 1948 to 1978 was not as effective as the one in use now, and immunity from the older version may have waned. Since mumps is not as common nowadays as it once was, symptoms are not always readily recognizable by the average person. Educating yourself on the signs of mumps in adults is an important part of preventing full-blown cases and of protecting yourself and others. 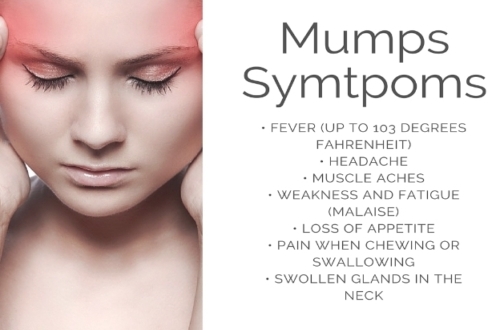 Mumps is a viral infection that targets the salivary glands, specifically the parotid glands located around your ears. Transmission can occur through saliva and nasal secretions, such as droplets expelled when coughing or sneezing, as well as close physical contact. The targeting of the salivary glands is also responsible for the signature swelling the disease is known for. It takes about two to three weeks following infection for symptoms to start showing themselves. It’s also possible to be infected and never show symptoms, which is known as being an asymptomatic carrier. Mumps in adult males can cause the painful swelling of the testicles. Although unpleasant, this does not normally cause infertility in the long term. In post-pubescent women, inflammation of the ovaries and breasts can occur. As with orchitis, this can be painful but does not normally affect fertility. If the virus manages to spread, the result can be inflammation of the brain. This results in neurological problems and is potentially fatal. Viral meningitis can happen if the mumps virus spreads through your bloodstream to the spinal cord. This is an inflammation of the pancreas. This can result in nausea, vomiting, and abdominal pain. Although rare (about five out of every 10,000 infections), mumps can damage the inner ear enough to cause permanent hearing loss in one or both ears. The connection is not definitive, but there is a suspicion that mumps can increase a woman’s risk of miscarrying, especially if she is infected in the first trimester. Mumps is caused by a virus, so antibiotics won’t do anything to treat it. There are also no targeted antivirals for mumps. 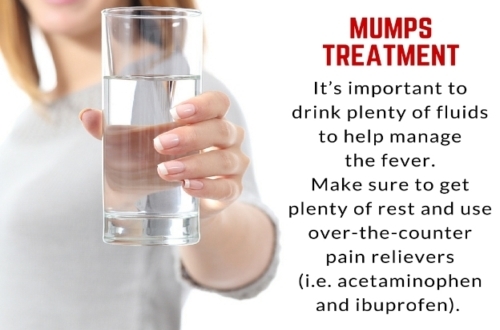 Since the duration of mumps in adults is about 10 days, treatment usually revolves around mitigating symptoms until the illness passes while keeping an eye out for the complications listed above. This usually means using various over-the-counter and home remedies for the symptoms of mumps. Get regular rest, especially when you feel weak or tired. Ice packs can be used to soothe glandular swelling and can be applied to swollen testicles. It’s important to drink plenty of fluids to help manage the fever. Some foods, particularly acidic ones, can aggravate the pain of the salivary glands. Avoid sour foods, citrus, and similar items. Since chewing can be painful due to the swollen salivary glands, it helps to use a diet of soft foods such as soup, applesauce, yogurt, etc. Over-the-counter pain relievers such as acetaminophen and ibuprofen can also help. If possible, avoid people who have not been given the mumps vaccine, pregnant women, and those with a compromised immune system. You should also notify anyone you were in close contact with immediately before symptoms started appearing. Mumps is at its most contagious from up to two days before symptoms show themselves to around five days after. The usual rule of thumb is that a person with mumps should be considered contagious for a full week after the initial diagnosis, even if the symptoms have not fully faded. These reasons do not automatically exclude you from getting the vaccine, but are signs that you and your doctor should discuss whether you should either wait before getting vaccinated or abstain from vaccination (1). Although the salivary gland swelling is distinctive, it’s always best to get a proper diagnosis from your doctor if you think you have mumps. You should also see your doctor if you develop signs of complications (testicular swelling, abdominal pain, confusion, etc. ), have an immune deficiency, or are pregnant. Although mumps in adults is not inherently riskier as it is with, say, chicken pox, the illness is still one to keep an eye on and to be vaccinated against if possible. Mumps Scare — Should You Be Concerned?